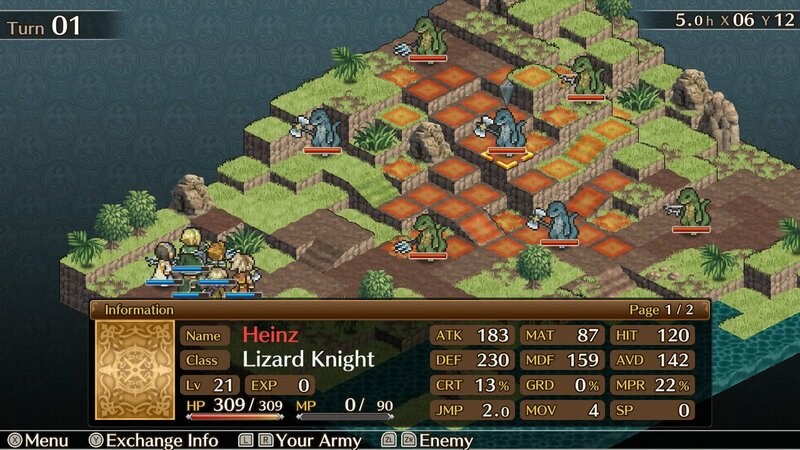 The Mercenaries Saga games have carved out a successful niche on the Nintendo 3DS over the past few years. A set of tactical RPGs with some loose narrative connections, these games were noted for solid combat systems as well as class customization for the characters. While a collection of these three games released earlier this year on Switch, Mercenaries Wings: The False Phoenix is the first game developed with consoles as the target market. While Mercenaries Wings shows more of its forebears’ DNA than might be expected with a platform jump, it nonetheless serves as a successful incremental improvement over the Mercenaries Saga games. Fans of tactical RPGs will enjoy Rideon’s traditional take on this genre. Despite being on the Switch, it’s readily apparent that Mercenaries Wings harkens back to the 16-bit era with the sprites it employs on small grid-based maps. However, these sprites are able to convey quite a bit of the characters’ personalities and it is a nice touch to see them change depending on how the characters are equipped. Unlike earlier Mercenaries games, each character has multiple portraits to convey emotion and match the dialog which makes the story a bit more engaging as there are no cutscenes in this game; the story is told strictly via text boxes. There has also been an effort to add more artistic detail to the maps, but with mixed results. The graphical variety is welcome, but it results in some maps being too busy with statues and trees that obscure the units themselves. Since the camera has a fixed isometric view, these issues aren’t player remediable. Despite these small niggles, the graphics get the job done. Would it be in poor taste to ask this lizard for some ketchup? The style of the story also harkens back to earlier generations in its simplicity. The game is set in the Kingdom of Dryden, a land that is said to have been founded with the help of a phoenix that cut through a thousand foes. The current king, Harold, has taken this bloody past to heart and has spent the entire ten years of his reign warring with Dryden’s neighbors. This constant warfare has led to strife at home and now Harold faces an insurrection to complement the conflict abroad. To put down the rebels, the king has begun employing — as the game’s title implies — mercenaries, including the Crimson Birds led by Jeremy and Cecil. Players will command the Crimson Birds as they fight rebels and learn the true story behind the founding of the nation. The story is straightforward and predictable: characters who appear to be evil are so and most of the twists will be familiar to RPG veterans. However, Mercenaries Wings is aided by good pacing; it doesn’t force the player to marinate in lengthy story sections but instead gets to the point and moves on. 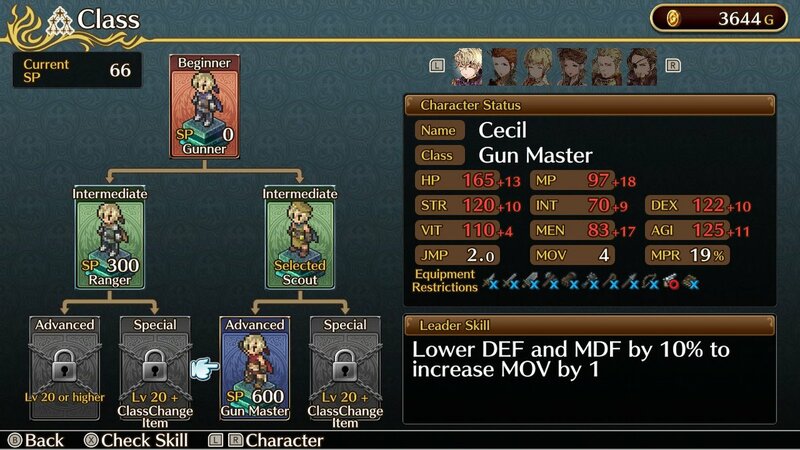 The characters are also a pretty likable bunch with Cecil’s development being particularly interesting to follow. New to Mercenaries Wings is a branching story path. At the end of chapter seven, players can choose whether to stick with serving the king or swap their allegiance to the rebels fighting him. The separate routes still use the same maps, though in a different order and with varied arrangements of enemies. However, the stories themselves diverge significantly and complement one another while fleshing out the narrative from the opposite perspective and involving different cast members, thereby adding replay value. However, while new difficulty modes unlock after completing the story, Mercenaries Wings does not provide an easy way to get back to this decision point so players should keep a separate save file to avoid being forced to re-experience the first six chapters of this twenty-two chapter game. 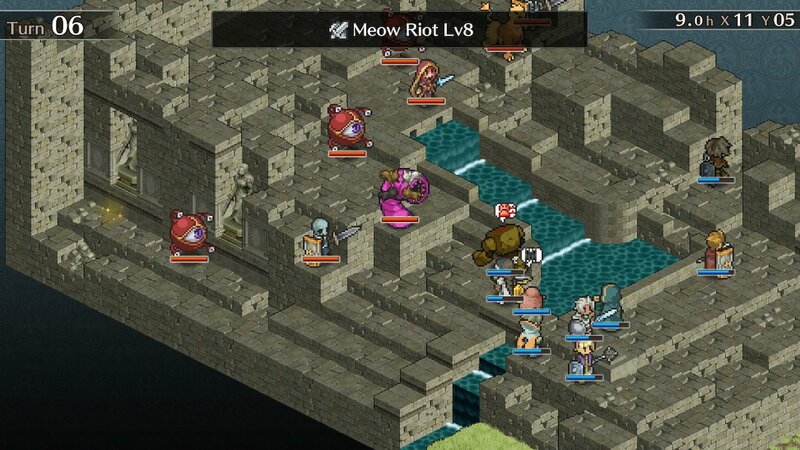 Mercenaries Wings has 674% more meows than previous Mercenaries games. While the story is effectively entertaining between maps, the combat is at the heart of this tactical RPG. This is a smaller scale strategy game with maps allowing anywhere from three to eight allies, including a mix of melee, ranged, and magic-based units. The gameplay strikes a nice balance between simplicity and complexity. It looks and plays like a traditional tactical RPG with both elevation and character orientation playing a role in the amount of damage done and hit percentages. Aggro also figures into the equation, with enemies more likely to target friendly units the more attacks they’ve carried out. Aggro can be manipulated by a number of different skills and some units can even create dummy units with high aggro to distract enemies. The individual characters’ skills are born out of the class system, which will be familiar to Mercenaries series veterans. At the end of each battle, the participating characters receive skill points that can be spent between missions to acquire and level up new abilities. Each character starts with a base class and then has six other potential classes to work through. New classes unlock based on character level as well as requiring the spending of those precious skill points, with some late-game classes also requiring a special item. While the class equipped affects the character’s base stats and only one class can be equipped at a time, all the skills learned from other classes by a character are still available to use in combat. Unlocking classes and customizing characters is quite a bit of fun. A new wrinkle to combat is Leader Skills. Before each battle, players choose one unit to lead the troops, conferring stat buffs or other special bonuses depending on the character selected. Choosing between extra HP, greater movement and other buffs adds to the strategic decision-making. The enemy AI will be initially passive — most units won’t approach until a character is placed within range — but once awoken, enemies will freely throw everything they have at players. It provides a fun challenge on normal difficulty and players will probably need to make use of free maps — recycled story maps with new enemies — for some grinding. Easy difficulty is available for those that are looking for less of a challenge, though the difficulty decision must be made at the beginning of the game and can’t be changed thereafter. There is still no voice acting in Mercenaries Wings, but the musical selection has seen a welcome improvement in variety and quality. It effectively evokes the feel of its 16-bit forebears with tender scenes complemented by touching violin pieces. However, a bit more variety in the menus where so much time is spent kitting out and customizing the party would be welcome. Mercenaries Wings: The False Phoenix is another small step forward as Rideon continues to slowly refine what is already a very strong base. It has great combat that incorporates ample customization and depth without being intimidating or getting bogged down with needless subsystems that ultimately add little. While the story may not match the heights of the genre, the characters are likable and it’s well-paced to keep moving toward the next mission. Simply put, Mercenaries Wings is strategy RPG comfort food for any RPGamers hungry for a fix.